I've been thinking a lot about labels lately. I recently wrote an op-ed about denominational labels in Judaism that was published in the Detroit Jewish News and on the Huffington Post website. In it, I explained how ambivalent I am about labeling individuals because these labels don't always help us understand the individual better. Calling a Jewish person an "Orthodox Jew" doesn't tell us much about them. 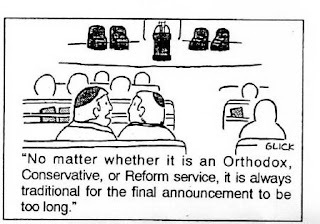 In fact it only leads to misperceptions (Are they Modern Orthodox or Ultra-Orthodox? Are they actually unobservant, but affiliate with an Orthodox congregation?). The analogy I've used several times in the Melton Scholars course on denominations that I've been teaching this fall has been that one could walk into ten different ice-cream parlors and find that each parlor sells an ice-cream labeled as "strawberry." Yet, despite the identical label, each strawberry ice-cream will actually taste quite different. As I wrote, the woman who labels her religious affiliation on her Facebook profile as "Recon-newel-ortho-conserva-form" isn't confused, hazy or even necessarily post-denominational. Rather, she is articulating the notion that we don't have to choose just one label. There is much more cross-denominational activity today, and based on reader comments to my op-ed on Huffington Post, this is just as true in many other faiths as well. In thinking of a photo I could use to complement my op-ed, I decided that a car bumper is often used to display ones ideological, political, and religious identity and affiliation. 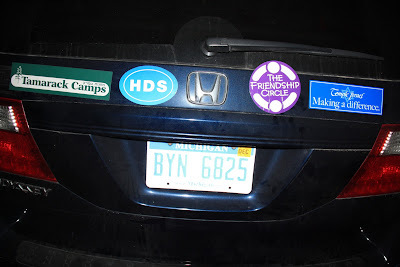 I imagined a car bumper with bumper stickers representing all the trans-denominational activities in which I'm involved --the pluralistic Jewish camp where I work, the Conservative synagogue where I'm a member and my children go to school, the Reform temple where I teach, the Reconstructionist congregation where I serve as the part-time rabbi, the Chabad-affiliated special needs for children organization I support, the community day school my child attends, and so on. I have long been fascinated by this concept of labels. Is the owner of a car really defined by the labels on her bumper? And if she were, how many bumpers would she need to let us know that she is a proudly Jewish, caring mom, tree hugger, vegetarian, Zionist, who is politically moderate, loves animals, nature, Swirlberry frozen yogurt, crossword puzzles, Gucci, Glee and her alma mater. Forget a second bumper; she would need a tractor trailer. In our Torah portion, God is speaking to Abraham and telling him that he is going to have to take his son up to Mt. Moriah, there to sacrifice him on the altar. But the words God uses to break the bad news are very deliberate. Take your son, God begins, bincha, and then y’echidcha, your only son, asher ahavtah, the son you love, and then and only then, God finally identifies Isaac by name. Now classically, the Midrash tells us that God stretches out his description of Isaac in order to break the bad news to Abraham slowly…gently. But I am not satisfied with that explanation. After all Abraham was not an idiot; he knew exactly to whom God was referring from the very beginning of that dreadful conversation. So here is another interpretation. In our tradition God is the one being in all the universe who is ineffable, which means beyond labels. God is not a male or a female, a Democrat or a Republican (although you would never know it from some of the political ads that have cropped up recently). And, according to the Torah, God does not even have a name other than Ehiyeh Asher Ehiyeh, I will be what I will be, or in other words, you can’t put a label on Me. And therefore it follows that, since we human being are made in God’s image, God understands us too as holistic, complex, multi-dimensional creatures. No single label can fully capture the essence of a person. You know, that rabbi with the gray hair at Temple Israel. No, no, not him....the other one…the short one. Oh! Rabbi Yedwab. Labels really never tell the whole story. So God tries to supply a multi-dimensional description of Isaac, whom after all is so much more than his position in the family, or the feelings his father has for him, or even his name. You know, Abraham: Isaac, the one whose essence is way beyond what any name, label or verbal description can possibly capture, your son, Yitzchak. Rabbi Yedwab goes on in his sermon to mention some interesting new research that has been done recently into the field of language and epistemology, and then offers some suggested rules for communicating with our "necessarily insufficient words." One of his rules is to stop communicating in Cyberspace. As a tech-embracing rabbi, I can't say I agree with that proposed rule, although I concur that we all need to be mindful of how we communicate through technology. Overall, I agree with Rabbi Yedwab's message. Just like God, we humans are beyond labels. It is all too easy to assign labels to everyone we know and everyone we read about. The alternative is to use our God-given ability to communicate in order to learn about others. Rather than asking them what kind of Jew they are, we should ask more specific questions about their beliefs and their doubts, their affiliation, their education and their faith history. We should ask them what gets them out of bed in the morning and what do they do to recharge their spiritual batteries. And then we should listen. In the HuffPo piece you admit you're a "card-carrying Conservative Rabbi." 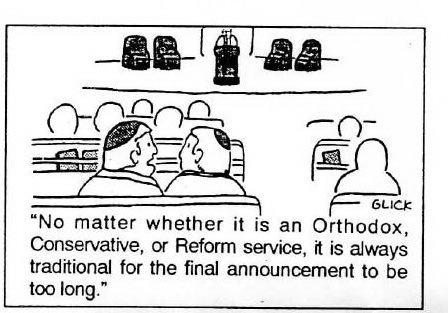 My understanding is that in actually hiring a rabbi, a synagogue has to choose a label, because there are placement rules that make it difficult for a rabbi to work outside of a movement. However, there seem to be more and more independent congregations anyway. How do you think this will play out if existing labels are becoming irrelevant?